Sausage Kolaches, more appropriately called Klobasnek, are better known as Sausage Rolls around these parts. People eat them fresh and hot, room temperature right out of bakery cases, and some prefer them warmed up in a microwave for 15 to 30 seconds. While I might be in Tex-Mex country, it doesn’t mean I like everything spicy. I don’t like cilantro either, but you already know that if you have read any of my other recipes. So, in usual form I got into the kitchen to make my own version. I prefer this dough for savory sausage rolls. The sweeter versions are better suited for fruit kolaches in my humble opinion. No, they do not look as perfect as those in the local donut shops and bakeries, but I do not have the commercial equipment they have either and I’m guessing neither do you. It’s OK, they won’t look perfect sitting next to one another on a plate, but you will know they are homemade. Imperfections are what gives homemade foods their character. I choose to make mine with half plain old fashioned smoked sausage, and the other half with smoked sausage that has cheddar cheese in it. 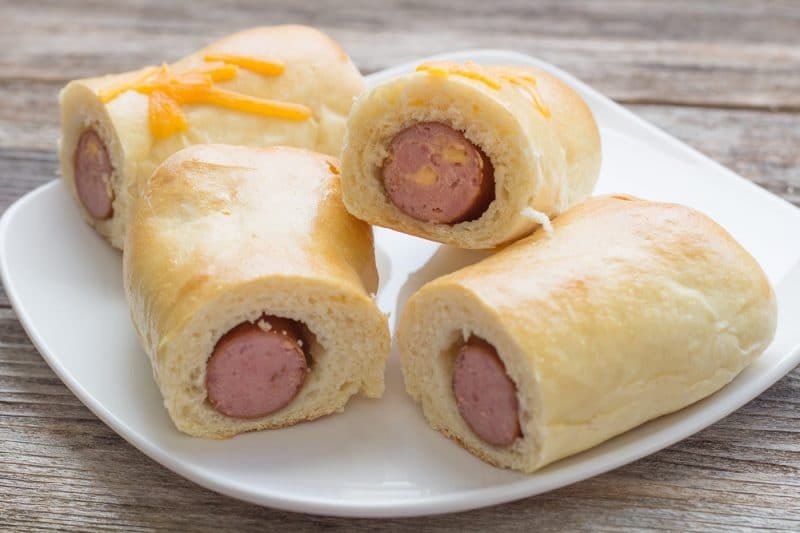 You can use whatever sausage you want, so long as it is cooked before you stick it into the dough. Even the smoked sausage needs a pre-cook, simmering for 20 to 30 minutes in water will do. Using a raw sausage like bratwurst or Italian is not recommended. The grease will seep through the dough and there is a chance that the meat will never be cooked to the appropriate doneness. Want spicy sausage rolls? Feel free to add some pickled jalapeno slices, just make sure that they have been allowed to dry on some paper towels before adding to the dough. Same thing happens here as with raw sausages, you will be a soggy mess on the bottoms of your sausage rolls. If you decide to add extra cheese to your sausage rolls, a good portion of it is likely to cook into the dough. This is also OK, just don’t expect to see loads of cheese rolling out when you break it in half after cooking. My absolute and favorite rolling pin for this project is a small wooden pizza and pastry roller. It can be found here on Amazon. This is also the rolling pin I use for my thin crust pizza. This rolling tool is lighter than a normal rolling pin and has he ability to get into small space you just wouldn’t even attempt to get a larger pin into. Honestly, the only time I break out my big rolling pin now is whenever I am making chicken and dumplings, flat bread, or cinnamon rolls. And yes, I do use an old fashioned wooden rolling pin with handles. I am old school and learned how to cook using one. I started too late in the day to make sausage rolls before going to bed. My dough spent roughly 18 hours in the refrigerator for a second proof. When I removed the towel my heart sank, the dough was dry and crusty on the top and it appeared it did not rise at all. I sprinkled water over the top of the dried out dough and flipped it in the bowl, recovered with a towel and allowed to sit at room temperature for an hour. To my surprise, the dough came back to life and started to rise again. This dough was the most perfect dough I have ever worked with. It required minimal flour on the counter. I have also made this without any refrigerated resting time, just an additional 120 minutes of second rise time in a warm environment. 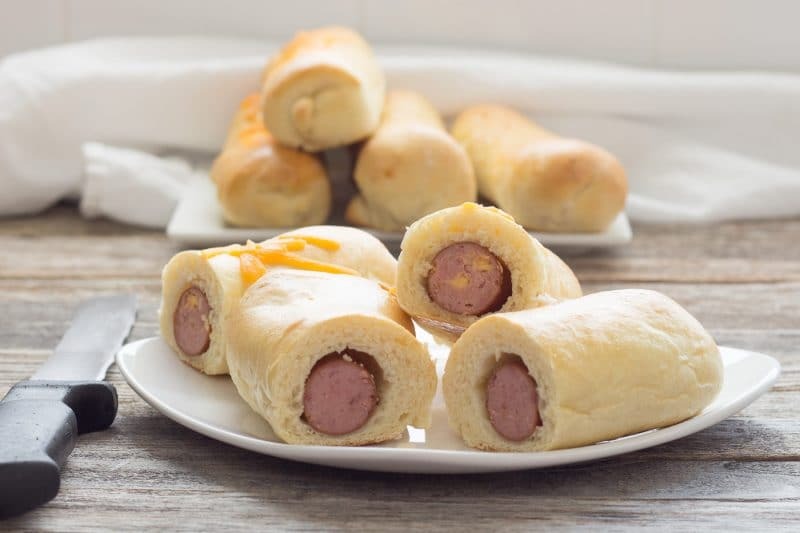 Savory breakfast treat, smoked sausage encased in a yeast dough and baked to golden perfection. Melt butter in microwave until just melted, set aside and allow to cool. Heat milk now so it has time to cool if it has been overheated. Milk should be at least 105 degrees F, but no warmer than 115 degrees F when added. Mix water with yeast in a small bowl. Add a couple of pinches of sugar from the ¼ cup sugar to the yeast and water mixture. Mix well and set aside to allow to bloom for 10 to 15 minutes. After yeast has bloomed, add remaining sugar, eggs, milk and melted butter to a mixing bowl and mix well. Dough hook or paddle can be used. Add 1 cups of flour, mixing well. Add kosher salt, mix well. Add additional 2 1/2 cups of flour, 1 cup at a time. Finish with last 1/2 cup. Dough should be a well-formed ball, while slightly sticking to the bowl in one or two spots. Add additional flour as needed to achieve slight sticking. The amount needed will depend on the weather and indoor humidity. Remove dough from mixing bowl and place into an oiled bowl. Turn dough over in bowl to cover all exposed dough with oil. Cover bowl with kitchen towel. Alternatively, plastic wrap can be loosely placed over bowl. Set dough aside in warm place for 2 hours. After 2 hours, deflate dough and re-cover. Allow dough to sit in warm place for an additional 2 hours or place in refrigerator for up to 18 hours. 60 minutes before sausage rolls will be assembled, simmer smoked sausage in water for 30 minutes. 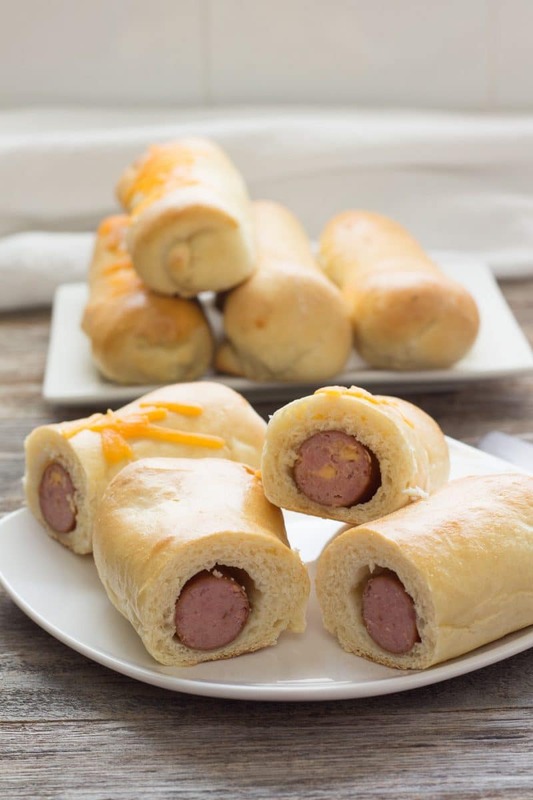 Remove sausages from water and drain on towels or a cooling rack for at least 30 minutes prior to wrapping in dough. 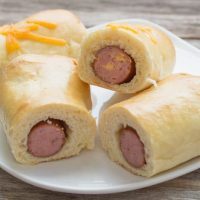 If refrigerated, when ready to assemble sausage rolls, remove dough from refrigerator and allow to sit at room temperature for about 30 minutes. Remove the dough and roll out into a rectangle slightly wider than 2 sausages laid end-to-end. You want to be able to wrap all 10 sausages. Alternately, use half the dough and wrap 5 sausages at a time. Cut dough into squares large enough to cover 1 sausage. Place sausage and optional ingredients on one piece of dough. Wrap each sausage, pinching ends and seams together. Cut excess dough from the ends after sealing, and pinch together again. Lightly roll the entire sausage roll to even out the dough. Place seam side down on a parchment-lined baking sheet or one prepared with baking spray. Cover with a towel or loosely with plastic wrap and allow to rise in a warm place for 60 minutes. Bake at 350 Degrees F until golden brown, 20 to 30 minutes. Allow to cool slightly before eating, the insides are very hot. Cook time includes 2 addition hours of rise time that may be replaced with up to 18 hours of refrigerated rise time instead.